A man wears buttons in support of Michael Brown while visiting the site where he died. Photo by Charles Riedel, Associated Press. Recent, highly publicized cases of police using deadly force against people of color, including the shooting of Michael Brown in Ferguson, Mo. on Aug. 9, underscore the need for the social work profession to call for reforms in the nation’s law enforcement systems. This issue is important for the profession, which has a long history of working to end all vestiges of institutional racism and racial disparities, including in law enforcement. President Obama on Monday said he will send Attorney General Eric Holder to monitor the situation in Ferguson, where protestors have repeatedly clashed with police. Holder has already ordered the U.S. Justice Department to lead a broad review of police tactics, including the kind of deadly force that lead to the death of Brown, an 18-year-old African American male who was unarmed. The need for such a review is urgent. In the past five years, the country has seen several dramatic and tragic incidents that have brought into question the use of force, especially deadly force by police against people of color. Examples of the use of excessive force by law enforcement officers include the the January 2009 shooting of a 25-year-old black man in an Oakland, Calif., that was dramatized in the film “Fruitvale Station”; the beating of a 51-year-old black woman by Alameda County, Calif. police in July; the August 1 chokehold death of Eric Garner, 43, in Staten Island, N.Y., for allegedly selling individual cigarettes; and the more recent shooting of Brown in Missouri. 74 percent of the decedents between the ages of 18-44. The racial composition of homicide-related deaths during that same period shows that there is a clear racial/ethnic disparity among the arrest-related deaths. Whites represented 42.1 percent of the decedents while the combined Latino and African American percentage of decedents was 54.5 percent, well above their percentage of the nation’s population. Another interesting fact is that more than 93 percent of the deaths were caused by local police departments or sheriff departments, according to BJS. 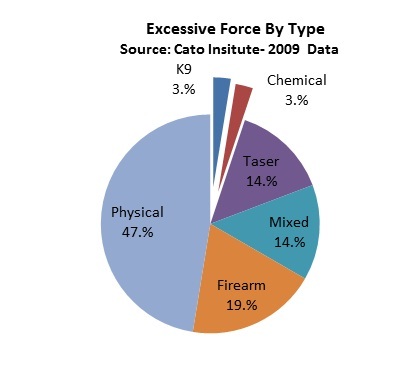 The excessive force data clearly suggests racial disparities in the application of over-aggressive and potentially lethal police action during police encounters. The data also reinforces the sense that there is a culture within some law enforcement departments that accepts aggressive behavior during encounters with young men of color. The result is distrust between black and brown communities and law enforcement agencies. The Justice Department is also expected to look into how police encounter or arrest people living with a developmental or psychiatric disability. Social workers are concerned because far too often the person being arrested is someone with limited capacity to respond to police commands or manage their emotions. The Justice review of law enforcement tactic is welcomed and necessary. In fact, DOJ’s announcement of its plan to conduct a review included a plan to analyze the efficacy of having law enforcement officers wear body cameras while on duty. Other law enforcement experts, such as the Public Advocate for the City of New York, have made similar suggestions. They point to the role that video recordings had in documenting the misconduct of law enforcement officers in the death of Eric Garner, the dragging a Brooklyn grandmother out of her apartment in her underwear, and a California Highway Patrolman repeatedly punching a woman in the face. The premise is that body cameras would have the effect of making officers use more caution in the use of force in an arrest. On the other hand, the cameras can provide evidence the officer used necessary and justifiable force in the face of a police brutality accusation. For more information on NASW’s criminal justice advocacy and related topics, please contact Mel Wilson, manager of the Department Social Justice and Human Rights, at mwilson@naswdc.org. Maybe we could also incorporate vigorous interventions that address the decompensation of so many African American families.. We would also do well to address the pervasive denial within some family systems that allow chukdren to engage in dangerous behaviors that plave everyone at riak. Responsibilty belongs to everyone. That is a disturbing and troubling comment, and smacks of blaming of blaming the victim. To respond to an article about police violence against people of color by saying we need to look at what’s happening in families of color is not only completely missing the point, it feeds into the excuses law enforcement uses when they summarily execute black and brown people: they acted or appeared dangerous. This is not a social work perspective at all. I am deeply proud to be a member of NASW when we take on the tough issues like this one. Clearly Ferguson highlights the problems of racism and law enforcement violence in a tragic and dramatic way, and social workers need to advocate for reform. However, this is not simply an issue of police force. Ferguson is a community that has experienced structural oppression, poverty, and systematic racism for years. As social workers part of our responsibility is to expand the dialogue to the larger social justice issues that face myriad communities and to work for change. All law enforcement officers should be required to go through sensitivity training. Can’t forget about the 90 year old man tazed to death, people beat out of their wheel chairs, and Kelly Thomas who was unable to comply due to his disability. I cried watching that Kelly Thomas video, and the officer raised his fist at him and even said he was going to beat him 20 minutes before his death. I my self have been cavity searched, slammed around, profiled, locked up, and harassed all because I have a problem with the retinas in my eyes that causes the pupils to act as if I have consumed an an intoxicant.